Lying in the middle of the largest expanse of sand on earth the Okavango Delta is one of Africa’s most amazing, sensitive and complex environments. Unique as the largest of the world’s few inland deltas, the placid waters and lush indigenous forests offer a safe haven for innumerable bird and wildlife species. The renowned Duba Expedition Camp sits in the heart of classic Okavango Delta habitat. A matrix of palm-dotted islands, flood plains and woodland, the 77,000 hectare private concession typifies the region’s unique landscape. Many consider Duba Plains to be the Okavango’s Maasai Mara because of the sheer volume of wildlife. Duba Plains prides itself on its extraordinary wildlife experiences with reliable sightings of lion, buffalo, red lechwe, blue wildebeest, greater kudu and tsessebe. Elephant and hippo trudge through the swamps and leopard, and some nocturnal species, can be sighted as well. Birds abound, and the area is a birdwatcher’s paradise. Okavango ‘specials’ include the rare wattled crane, Pel’s Fishing owl, white-backed night heron and marsh owl. Great Plains Conservation is the only operator on the concession, offering guests the ultimate opportunity for private wildlife sightings. The intimate camp consists of six expedition-style tents of light airy canvas on slightly raised decking, each with views of the surrounding floodplain. Each tent has a small desk and private verandah plus en-suite facilities consisting of flush loo, double basins and indoor shower. Fans and careful open-air design maintain comfortable climate for rest and relaxation. The main area is under sweeping marquee canvas, on raised decking and consists of an open-concept dining and lounge area which opens to the outdoors on all sides. In the evenings, the fire pit is always a popular spot to enjoy an Amarula and recount the day’s events. Duba Expedition’s Toyota Land Cruisers are aptly named ‘Swamp Vehicles’ due to their extra-high suspension and absolutely huge tyres uniquely designed to traverse the floodplains. Duba Expedition Camp is a combination activity based camp, allowing guests to explore the Okavango Delta’s permanent channels by boat when water levels allow, as well as open game drive vehicle safaris. This is truly an invigorating, yet peaceful experience, allowing for wildlife and birding viewing from the boat. 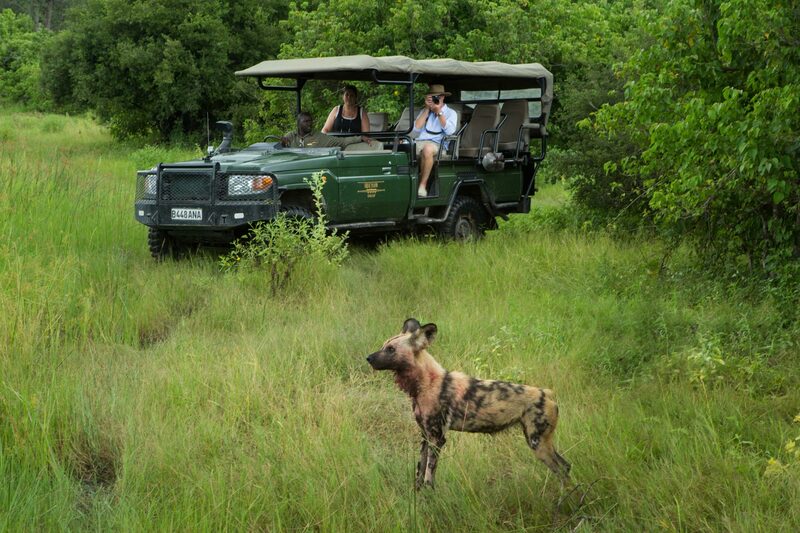 Guided game walks with licensed, armed guides are available, and these can be combined with boat cruise or game drive. The Selinda Reserve is a 320,00-acre private concession in northern Botswana at the crossroads of some of northern Botswana’s most prolific wildlife areas; upstream from Savute Channel and Chobe National Park and north of the expanding reaches of the greater Okavango Delta. This unique position gives it the advantages of both of these famous areas but with the tremendous advantage of exclusivity. It is a truly spectacular and varied landscape that boasts staggering wildlife populations in diverse habitats year-round. Home to some of the classic species, such as leopard, lion, elephant, buffalo, Red lechwe, zebra and giraffe, it is also a refuge for some of the more uncommon species such as African wild dog, cheetah, roan and sable antelopes. Selinda Explorer Camp sits in prime predator habitat, in a location, which we handpicked based on exploring this area for years. Lion, leopard and cheetah and the recently discovered Explorers Pack of African wild dog hunt these parts regularly. Giraffe, buffalo, roan and sable are possible sightings. At the peak of the dry season in late September, the Selinda Reserve has been documented to hold up to 9,000 elephants. There is phenomenal bird life along the Spillway’s banks for those looking for some ‘lifers’. Selinda Explorers Camp is a classic camp that transports guests back to the time of authentic safaris, but with a modern twist and hospitality. The camp’s focal point is the Bedouin-style main area consisting of a lounge and separate dining room. The four guests tents provide comfort and style but with a magnificently raw spirit. Subtly placed under the shade of the riverine forest, the camp is designed in the style of the early explorers both in philosophy and practice. This authentic tented camp draws on traditions of the classic East African safari with beautifully detailed campaign style furniture made from recycled hard woods, and soft furnishings from Zanzibar and the East. The custom-designed tents consist of two rooms plus verandah, as well as a private open air ‘bustani bathroom’ with hot water showers and flush loo. All tents are at ground level, including the main lounge and dining area. This is an unassuming camp, light on its footprint but heavy on its experiential luxury. The atmosphere of the lodge is one of bush elegance with relaxed bohemian style, complemented by attentive staff, private professional service and fabulous food. With a maximum of only 8 guests Selinda Explorers Camp focuses primarily on the traditional safaris of walking and canoeing when the Selinda Spillway is flooding. All guides are firearm trained and will be armed on walks and canoes. * Please enquire for current pricing and availability.